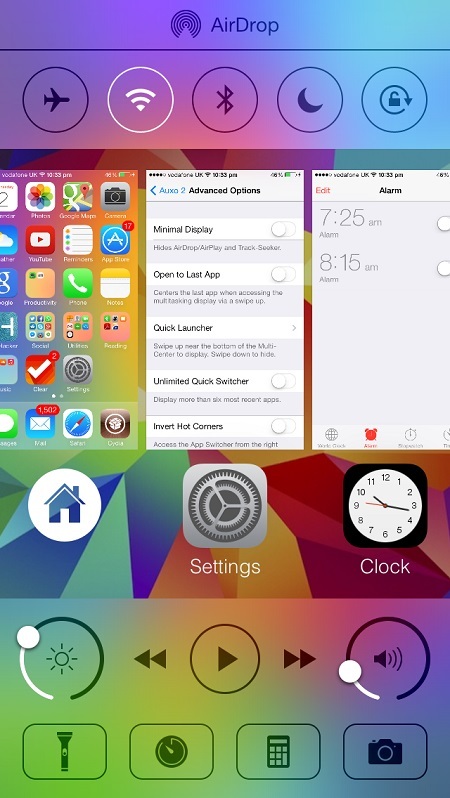 One of the most popular iOS tweak Auxo has been updated for iOS 7 users. The new Auxo 2 with full support for iOS 7 powered devices has been released and can be downloaded from Cydia right now. Auxo 2 just like the original version of the tweak focuses on the app switching in addition to the Control Center. This tweak essentially merges the app switcher and Control Center in one unit allowing users to switch between applications as well as access toggles and shortcuts from a single screen. The best thing Auxo 2 is that it does not take anything away from the Control Center or the App switcher while merging them together into a single screen. All the settings available on Control Center can be accessed from the new Auxo 2 page along with the previews of the apps that are running the app background. Quick Switcher and Hot Corners are two new features that have been introduced in this version of the tweak. These are clever features that allow users to quickly access the homescreen or easily switch between apps by swiping up from bottom right or left sides of their screen respectively. The tweak comes with preference bundle that allows users to turn off the Multi-Center feature (which merges CC and app switcher), toggle on/off the Quick Switcher feature and the Hot Corners feature. Auxo 2 for iOS 7 is available for iPhone and iPod touch only. According to tweak’s Cydia description the support for iPad will be added in the version 1.1. If you already own Auxo then you can get the latest version for $1.99 only. If you are a new user then Auxo 2 will cost you $3.99. Auxo 2 (iOS 7) is a great tweak that features a gorgeous design. The tweak has been executed well and makes the experience of Control Center and App switching better. The Hot Corners feature will be welcomed by iOS users who have been waiting for a Zephyr alternative for iOS 7. It is a must have for every iOS users who jailbreaks his or her device.